3.27 The clouded-mind wearing the false-face of egotism thinks that it is the doer; in actuality the discharge of the three gunas initiates all natural-activities. The three gunas (calmness, restlessness, inertia) is the natural instigator of activity. The egotist believes that he/she is the natural creator and agent of action behind all activity—in a real sense blinded by a false face of power. 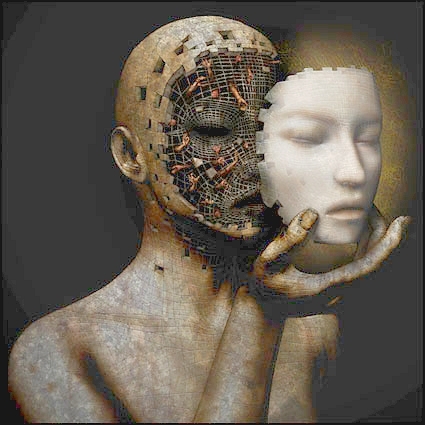 Behind the mask is an agent who is very dependent upon a vast array of proclivities that are the natural mechanisms (a play of the gunas) that induce a given set of apparent self-motivated actions. 3.28 Arjuna, the illumined mind recognizes the natural proclivities of the gunas and is never attached to them. Such a one recognizes that qualities naturally depend upon other qualities and simply remain detached from their natural functions. Certain natural qualities (the interplay between the gunas) occur of their own accord and are not initiated by any “doer”. The illumined Mind is aware of these natural instances and is never captivated by their actions and reactions that occur spontaneously. In many instances these actions are sparked by hidden genetic-karmic mechanisms and no more. 3.29 Those still attached to the natural proclivities of the gunas remain bound to their natural effects. Yet, one who is aware of these natural functions should not disturb the mind of the lesser-able who are totally ignorant of their nature. 3.30 Remember to daily dedicate all your actions to me. If you do rest assured that you will remain centered in the Self (Atman) and will not be afflicted by any feverish longings, selfishness, or ego-spawned grief. This entry was posted in The Bhagavad Gita and tagged Arjuna, Bhagavad Gita, ego, egoless, gunas, Jewish Lights Publishing, Kendra Crossen, natural proclivites, Self. Bookmark the permalink. “They are able to penetrate the self’s true nature by self-power and the self’s own freedom, to dwell in the transquility of unrestricted freedom of the authentic self. It is not the place of ordinary, ignorant persons like me to disapprove of these higher spiritual states. I can do no more than admire them and long for them. The saint or sage may of course accuse me of a lack of faith in my own Buddha-nature, but I am at a loss as to what to do about this unbelief of mine, since it is the very thing that makes me the ordinary, ignorant person that I am. Even though I can understand intellectually that the self’s true countenance is none other than the Buddha himself, I cannot witness to this out of my own experience. However many tears I shed over my unenlightened state, and however overwhelmed with shame I become for my own powerlessness, I remain utterly incapable of penetrating my self’s true nature. It is only in acknowledging my state without arrogance and submitting myself to it in shame that the miracle of belief in and witness to my powerlessness and ignorance are overcome by the absolute, even though I remain just as before. This is precisely the crux of Methexis’ predicament…more and more tears over not being “successful” trying to obtain some nebulous “state of enlightenment”; Just who is it who “feels” overwhelmed with shame, who is it who feels powerless? And just who is it who’s trying to penetrate-through to “my” self’s true nature. Where I live right now, in upstate NY, we are experiencing the effects of a “polar vortex”, wherein frigid air from the North Pole is entrapped in a jet-air stream that is streaking south across the mid-west and eastern seaboard—believe me, its effects are quite numbing. It seems to me, Methexis, that your mind has been entrapped in this polar vortex for quite some time—you’re completely “frozen” in this state of helplessness. Yet it’s all only a thought, a conjecture—truly a real “no-one” entrapped in an Iceland of its own making. Crush the ice, man—it’s gotta be uncomfortable in that frozen world. In response to knowing the gunas: it seems worth remembering that the gunas don’t go away upon recognizing their influence. Thus this knowledge is not a static state, such as knowing how cold it is in new york, but indeed being aware of the nature of the constantly changing aspect of mind as an ongoing practice, without measure or compare. Great insight into the gunas. I had my first experience into their nature through the teachings of Nisargadatta Maharaj many moons ago. He was quite the teacher, although his own gunaic-nature truly did him in with his smoking addiction. Even after he was diagnosed with throat cancer he still kept smoking the damn things! And let’s also remember that amid the howling storm of snowy winter it is still possible to come upon one’s self nature as if an abominable snowman in the himalayas. Remember that’s mind with a small “m”. It’s really a constant changing state of the skandhic consciousness in the sticky pitch, or frozen wasteland of the gunas. You are most still certainly in the early effort stage, and you know full well that the tears were really yours, not from Tanabe, although you nicely used him as a cloaking device. I will not run and cower from my own ignorance. If we are going to weep it should be for the state of contemporary buddhism, which adrift on the rubbish barge of materialism, is without recourse in ultimate reality. This appears to the materialist as absurdity, but as a vehicle of transcendence, logic alone will not suffice. From thence enters hedonism and delight in phenomenal dross. What paltry bits of flotsam we cling to in this ignorant, confused age of reason. Vajra: You’re right, it was really my own tears. And it’s true I’m at the earliest stages, although there’s hardly any effort. Methexis perhaps you should apply yourself to a martial discipline such as kyudo, and become, as I did, a kind of shabutsu, a shooting buddha. This way you can learn single focus and apply your discipline to contemplation. You are still looking for a target, but that is not the way. It is to release any hold on the idea of target and to allow the psychophysical self to dissolve into being only the action, not its result. Bow & arrows? I don’t know about that. I’m more of a Glock type of guy. Then it is of no account to train, because it is the object and not its original source which you seek to master. At best you will learn gross motor skills and stillness, even breathing, but because you still perceive the object as separate from mind, there can be no great spiritual insight gained from such practice. I see your point, but I’m sure you can apply your shooting-buddha fundamentals to a Glock as well since it’s indifferent to the object. If I had to go traditional, I guess I like kendo. But it’s 100 kilometers from here. It’s a bit far to drive so many times a week. The driving would be more of a “mind practice” than the kendo itself! Perhaps I can practice kotobado – the Way of words. If the object is indifferent, then one should be able to practice with words just as one practices with a bow or a Glock. Just wait till we get to chapter 14. Better yet, why not skip ahead to chapter 14 and teach everyone about it? I don’t read texts of non-Buddhist traditions. I don’t even read Western philosophy anymore – except for when I have to (due to certain obligations). It’s not a statement of superiority of Buddhism or disrespect of other traditions, it’s just that my study of the Buddha-Dharma is not complete, so it’s better to keep focusing on it, both with contemplation and textual study. I shouldn’t even comment here because I’m disturbing the Gita debate. So I will stop. Don’t pack up your zafu and go into reclusion, methexis. The gita is like a good friend from out of town, who comes to delight in the dharma.